Do Succulents Need a Lot of Sunlight? Succulents store moisture in fat roots, stems and leaves, accounting for their reputation of requiring little water. Their requirements for light, however, vary more widely, depending on whether they evolved in desert, alpine or tropical climates. Cactuses are also succulents. Hens and chicks, an alpine succulent, likes lots of sun. Desert rose (_Adenium obesum_, U.S. Department of Agriculture plant hardiness zones 11 and 12), a colorful desert succulent, thrives in full sun if grown outdoors or taken outdoors in the summer. Grown indoors in winter, it likes cool temperatures and a window with full light. Hens and chicks (_Sempervivum tectorum_, USDA zones 3 through 8) evolved in the alpine region of southern Europe. Hens and chicks likes full sun outdoors and lots of light if grown indoors. Christmas Cactus (_Schlumbergera bridgesi_, USDA zones 11 and 12) evolved in shady under-story of tropical forests in Brazil. Widely grown indoors, it yields rose, peach, purple and white flowers for the Christmas holiday season. Christmas cactuses can tolerate winter sun while sitting in a window, but sitting in a window facing full summer sun will kill them. In places warm enough to grow outdoors, Christmas cactus does best growing in light shade. A succulent getting too much light can turn yellow or orange or look bleached or off-color, although disease or giving it too much water can make it look the same way. A succulent not getting enough light will look like it is stretching or reaching to get to light. If a succulent bends toward the window at a 90-degree angle it needs light and is trying to get more. If a succulent in a pot becomes unbalanced in an effort to get to the light, rotate the pot, but do it slowly so the side that wasn't getting light doesn't get scorched. In their natural habitat, many succulents, especially young plants, get some shade from trees, shrubs and tall grasses. Unless they get some shade, some species of spineless cactuses will get sunburned in midday or early afternoon. If a succulent looks reddish, the cause is likely too much sun. If you move your succulent from poor light into bright sunlight without transition, it can scorch the plant, scarring it for life. If you move a potted succulent from indoors to outdoors, move it gradually to sunny locations. Outdoor plants can get sunscald if the weather turns suddenly hot. To prevent sunscald by a potted plant in hot summer weather, move it to filtered light behind a shade screen or under a tree. 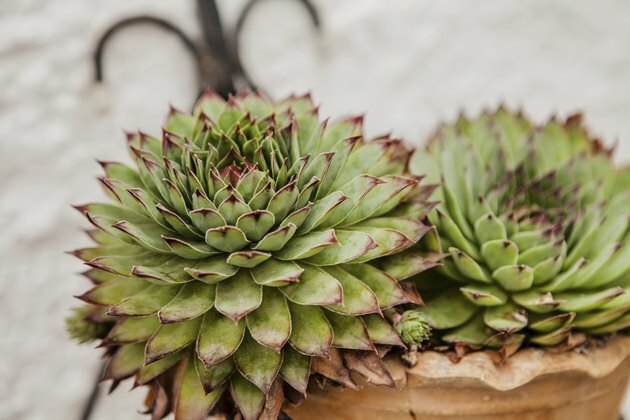 Most indoor succulents will thrive in a bright indoor spot or on a sunny window sill. Give them the sunniest window or brightest light you have. Most succulents will need four to six hours of strong light. Avoid locating succulents in north-facing windows or shady corners. If you only have a few plants and can't give sufficient natural light, give them light from two 24- or 48-inch-long 40-watt fluorescent tubes. One tube should give cool white light that corresponds roughly to natural daylight, and one should be a warm white tube that contains more light from the orange and red spectrum. Place them 8 to 12 inches above succulents.